Sub-Saharan Africa knows more than its fair share of disasters induced by natural hazards. The past few months alone have seen drought in the Horn of Africa, floods in Mali and Rwanda, and landslides in Ethiopia and Uganda. Between 2005 to 2015, the region experienced an average of 157 disasters per year, claiming the lives of roughly 10,000 people annually. Losses from disasters are only expected to rise as the impacts of climate change intensify across the region. Structural factors, such as the dependence by many sub-Saharan African countries on rain-fed agriculture and tight fiscal space in budgets, means that disasters can have a debilitating impact on their growth and development prospects. Given these challenges, governments have often been reliant on external aid and, when possible, budget reallocation to pay for disaster recovery. However, this financing strategy comes at a cost. Uncertainty and delays in aid flows tend to complicate planning for relief and recovery efforts, while budget reallocations can divert funding from vital development programs. Launched in 2015, the Africa Disaster Risk Financing (ADRF) Initiative works with 19 sub-Saharan African countries to develop and implement tailored financial protection policies and instruments which can help them respond quickly and resiliently to disasters. The ADRF Initiative is the first program in sub-Saharan Africa to focus on the broad disaster risk finance (DRF) agenda. It is financed by the European Union (EU) and part of the Africa, Caribbean and Pacific (ACP) – EU Program Building Disaster Resilience in Sub-Saharan Africa. The ADRF Initiative is jointly implemented by the Global Facility for Disaster Reduction and Recovery (GFDRR), the Disaster Risk Financing and Insurance Program and the World Bank Africa Disaster Risk Management team, which is part of the World Bank Social, Urban, Rural and Resilience Global Practice. At the most basic level, DRF aims to strengthen countries’ ability to manage economic and fiscal stresses when disasters strike. There is no one-size-fits-all approach to DRF – countries have a wide array of financial protection policies and instruments from which to consider, including sovereign risk finance, social protection programs, as well as agriculture and risk insurance programs. Since its inception, the ADRF Initiative has focused on three areas to pioneer the DRF agenda in Sub-Saharan Africa. When governments begin to evaluate the financial protection policies and instruments that might form part of their DRF strategy, it is critical that that they have the disaster risk information they need to make this assessment. What, for instance, are the main disaster hazards and what would be their likely physical and social impacts? Which populations and assets might be most exposed and vulnerable to these impacts? Ultimately, the answers to these questions will help determine the right mix of DRF policies and instruments for a particular country. Accordingly, the ADRF Initiative is developing multi-hazard disaster risk information for 9 countries in sub-Saharan Africa: Cabo Verde, Ethiopia, Kenya, Niger, Malawi, Mali, Mozambique, Senegal, and Uganda. This information is used to inform dialogue on DRF with national governments and, in the process, shaping the broader disaster risk management agenda in these countries. For instance, data collected through the development of the risk profile for Mozambique has informed the dialogue on school safety in the country, detailing the financial impact of disasters on schools, and laying the case for the need to invest in making the country’s schools more resilient to disaster. Beyond gaining a fuller understanding of their respective countries’ disaster risks, governments must also wrestle with a range of complex policy and institutional questions when they formulate a DRF strategy. Does the government have access to sufficient resources in the event of a disaster to respond effectively? Which external parties can help secure financing, and what are the conditions for providing this assistance? Does the government have appropriate systems and policies in place to transparently move and implement resources where needed following a disaster? With ADRF assistance, the World Bank approved a catastrophe credit for Kenya in June 2018, which provides a US$ 200 million contingent line of credit to the East African country. 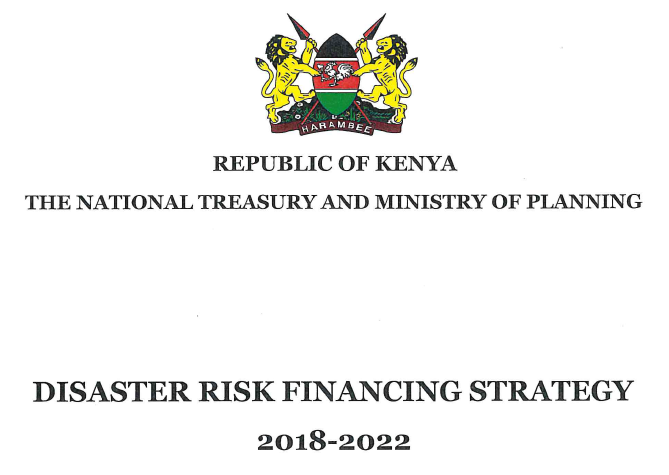 In preparation for developing this credit, the government of Kenya approved a National DRF Strategy, the first to be implemented in sub-Saharan Africa. Kenya also improved its policy framework for managing natural hazard risks in urban, land, and water management. The ADRF Initiative is supporting national governments of 19 sub-Saharan African countries to develop financial protection policies, instruments and strategies, which are tailored to the local context. Case in point: in addition to its instrumental support in Kenya (see box), the ADRF Initiative is engaged with Ministries of Finance to conceive and design country-driven DRF strategies and explore contingent financing options in several countries, including Cabo Verde, Malawi, Mozambique, Madagascar, Lesotho and Benin. The ADRF Initiative is also supporting countries establish shock responsive safety nets, which rapidly deliver emergency assistance to vulnerable households in the event of a disaster (Uganda, Kenya, Malawi, Niger, Sierra Leone), as well as agriculture insurance programs which unlock critical assess to credit for low-income farmers (Uganda, Kenya, Rwanda). As interest in DRF continues to grow in sub-Saharan Africa and beyond, it has become all the more important to glean lessons learned from the ADRF Initiative’s work thus far that could help other countries develop their own DRF strategies while, at the same time, strengthening the effectiveness of DRF efforts already underway. The ADRF Initiative has already organized nearly 60 knowledge exchanges and trainings designed to gather and disseminate lessons learned and build the capacity of governments on DRF. Most recently, in May 2018, an ADRF Initiative event was organized on the margins of the Understanding Risk Forum in Mexico City, bringing together over 60 participants, including 40 sub-Saharan African government delegates, making it the largest such gathering of African DRF practitioners to date and demonstrating the impact the ADRF Initiative has already had in building DRF capacity among governments in sub-Saharan Africa. While the ADRF Initiative has made huge leaps in pioneering DRF across the region, it does take time to effect the policy and institutional changes and also build the strong relationships with governments which are needed to get DRF off the ground. Yet against the backdrop of intensifying climate and disaster risk, this has also been clear from experience on the ground – enthusiasm for DRF and its potential to help countries respond more quickly and resiliently to disasters isn’t in short supply. That is cause for optimism that a resilient future for the countries of sub-Saharan Africa is on the horizon.